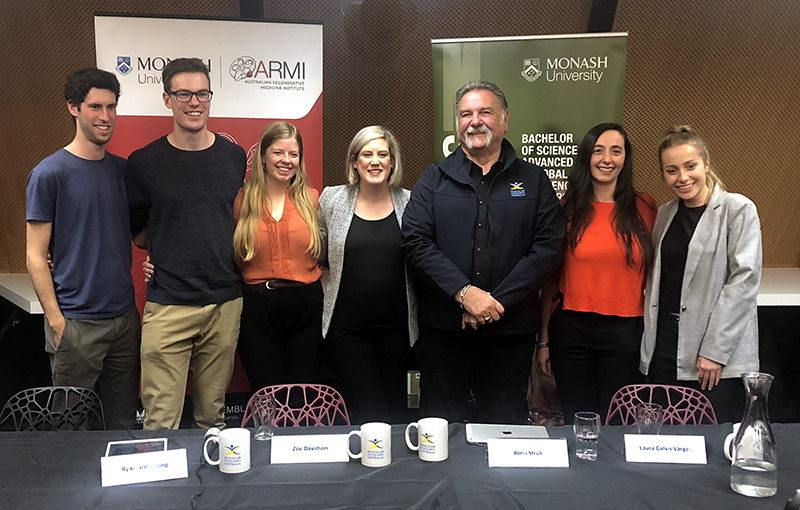 Last night the Australian Regenerative Medicine Institute (ARMI), Monash University and Muscular Dystrophy Australia held a Facebook Live Q&A “You Ask We Answer” event where the MD community had the opportunity to have their questions answered in real time by a panel of experts in MD. The panel included: Boris M Struk- Executive Director of Muscular Dystrophy Australia; Dr Zoe Davidson, Advanced dietitian leading research at Monash University Nutrition to understand the role of nutrition in Duchenne muscular dystrophy and Laura Galvis Vargas, PhD student researcher with ARMI. Laura is currently researching how muscle regenerates, by exploring the communication between fat and muscle tissue, which may assist the development of treatments for MD. It was an important event that opened up the lines of communication between researchers and the MD community. Muscular Dystrophy is a challenging field of research and for those who live with it, it can often feel like not much is happening. We have all been waiting for a cure for far too long. Other diseases and disorders seem to have taken priority in our society due to their prevalence. On top of this, there is now the internet, full of information, often misguided and inaccurate. It was priceless to have on-time answers from reputable sources, some of our best. There was also an overwhelming sense of hope being resurrected. The realisation that whilst things might have seemed too quiet for too long, there is a new generation passionate and dedicated to finding a timely solution, treatment or cure for MD. Furthermore, this new generation is generous in its willingness to share its knowledge and processes with the community. It is a new generation of researchers willing to open the doors of their labs and dedicated to making their research understood and translated for all to understand. How refreshing! Today at MDA, we have felt the ripples of renewed hope from our community and we are looking forward to forging a long and fruitful relationship with all of our researchers – local, national and international in the hope that collaboration will make for a much swifter solution. Research is not cheap. It takes significant dollars to fund labs, consumables, technicians, lab assistants and of course PhD students and Post Doctorate fellows. MDA does need the support of not only our MD Community, but the wider community to garner these essential resources to help us Make a Difference. Come join us on this journey of discovery and mutual support so that at the end of the day we can stand shoulder-to-shoulder, arm-in-arm in the knowledge that we have fought the best possible fight against this relentless foe – Muscular Dystrophy.